They say the kitchen is the heart of any home…and so stays true in this Santa Barbara stunner. Jodi G Designs tastefully redesigned this space into a cook’s delight. Reconfiguring the existing island for both form and function, the area now allows for seating and encourages engagement with friends and family. 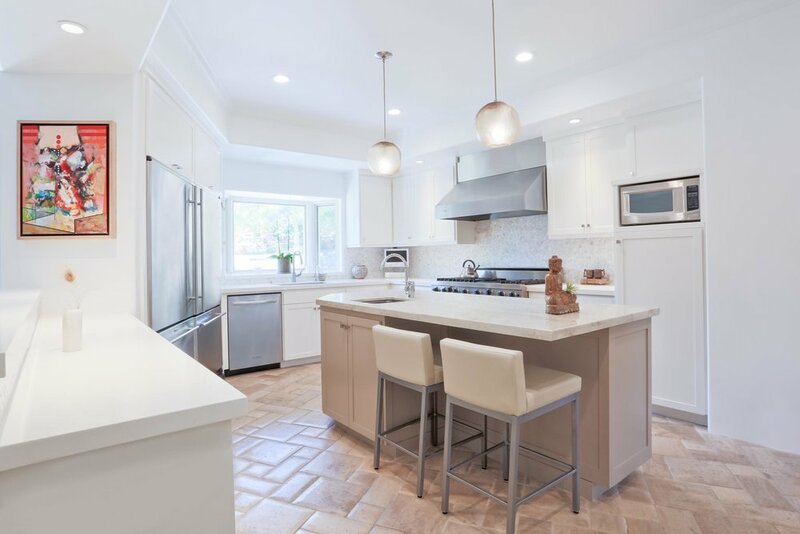 New cabinets with contemporary hardware, white marble countertops, sleek faucets and LED light fixtures were all installed to modernize this now timeless kitchen. Beautiful shelves were installed to showcase the owners’ personality and bring depth to the space. Neutral taupes and pristine whites serve as the perfect backdrop for the vibrant dishes soon to be plated. Prepped for cooking, serving and entertaining with a glass of wine, this state-of-the-art kitchen provides guests with the space to watch the chef at work.